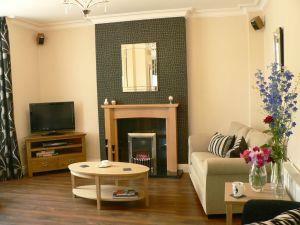 Ashberry Guest House01768 868601work Guest HouseIdeally situated 1 mile from M6, 2 minutes to town centre. Ashberry Guest House a newly-built, sandstone town house in Penrith, The Gateway to the Lakes. Ideal for touring The Lakes, Eden Valley and Scottish Borders. All our 6 en suite bedrooms are individually and tastefully furnished to a high standard. Ground floor accessible bedroom with en suite wet room. All our rooms have wifi, freeview LCD TV's, radio alarm clocks, hairdryers, hospitality tray with a selection of teas, coffee and hot chocolate, bottled water.